Thorn and the girls are first seen as suspects of the mystery that is going on in their hometown, Oakhaven. 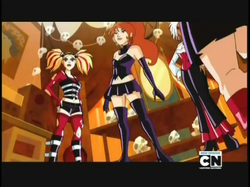 After seeing them perform "I'm a Hex Girl", the gang decides to follow them and see if they have anything to do with the mystery they are trying to unveil. Fred and Daphne even suspect that they are real witches, after seeing Thorn performing a strange ritual. Later, it is revealed that what they saw was just a herbal mixture that Thorn had made to soothe their vocal chords, and they even explain that they are actually eco-goths, and that Thorn is also a real Wiccan. They accompany the rest of the group in the search for Sarah Ravencroft's diary (which is actually a Witch's spell book) Later on, Thorn is the one who is able to trap the ghost of Sarah back in the book by reading a spell out loud to return her back into the book. To pay for the damage caused in the battle, the Hex Girls, along with Scooby and the gang, perform for the townsfolk. 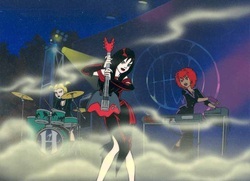 In the film they perform two of their songs: "I'm A Hex Girl" and "Earth, Wind, Fire And Air". Scooby-Doo! And The Legend Of The Vampire Scooby and the gang find out that Thorn, Luna and Dusk are to open the Vampire Rock Music Festival in Australia. When they are in the middle of singing their opening act, the giant Yowie Yahoo and his three vampire minions capture them, and it is up to the Scooby gang to find them. It is later revealed that they had been taken to the Vampires' hideout and were offered by the Wildwind a Great Barrier Reef Scuba Diving tour if they quit from the festival, to which they refused, so the members of the Wildwind let them to get out of that mess on their own. They eventually are able to come back to the place where the festival is being held, just in time to see the Mystery Inc. solve the mystery. They also join Scooby and the gang in their performance in the end of the movie. 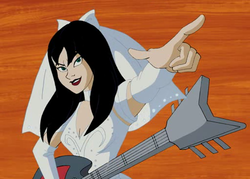 In the film, they perform "I'm A Hex Girl" and "Who Do VooDoo". What's New, Scooby-Doo? Season two The girls are in the Fortescu Castle in Transylvania, trying to shoot a music video on their latest song, when a vampire attacks them. The attack scares Dusk who barely got away and she tries to convince the others to get out of there before they get attacked again, but Thorn and Luna want to stay and try to finish shooting their music video. This creates an atmosphere of instability among the group. When Scooby and the Mystery Inc. arrive at the castle, they need to solve the mystery, while trying to prevent the girls from breaking up. In the end, Thorn, Dusk and Luna are able to wrap up the shooting, while enjoying the company of Scooby and the gang. Songs performed are: "Petrified Bride (Wanna Wed But I Fled)" and "What's New Scooby Doo?". The Hex Girls didn't miss a series since their first appearance, and their latest appearance has been on the 7th episode (In Fear Of The PHantom) of the season 1 of Mystery Incorporated, when (while the gang and lots of fans are on their show) the girls are having a show and the Phantom shows up asking them to stop doing music and making shows, or... else? Then Daphne goes undercover joining group, until she gets mad ad Fred and decides to go rock n roll as she becomes Crush (they sang their two famous songs, but now) and writes a new song called Trap Of Love obviously dedicaded to Fred (he loves traps and he broke her heart), but it all works out when they find out that Fantzee Pantz (their writer) was behind this revenging them after they destroyed his career as his manager left him to menage the Hex Girls!